A message from Tim Cheung, our Director of Sports and Leisure. To describe what we have achieved in the Nottingham Games 2011 as a success would be an understatement of great magnitude. Being able to see the whole Society, players and supporters, united as one on the playing fields, is such a memorable thing. I would like to take this opportunity to express my sincere thanks to all who helped us out, especially the team managers Lewina Liu and Jacqueline Kwan, for all their support and help in the preparation for and during the event. I am especially delighted to see the success of our badminton team, considering the fact that this is the first time we have put up our own badminton team in many years. Coming 2nd, just behind Nottingham's team, is nothing short of brilliant. We are all proud of you guys. Thank you for all the effort you have put in the team. Special mentioning to Tim Chung, who was responsible in putting together such a great team. Thank you. Our basketball team has always been one of the strongest in this tournament, and in the Nottingham Games 2011, this was proven true again. Coming 1st at the group stage, then unfortunately got beaten by Manchester; but the team showed their exceptional quality and perseverance in the 3rd playoffs, where they managed to close the gap and eventually overtake the team from Warwick. Again, everyone of us are so proud of the team. Special thanks to Jonathan Lam, Jonathan Yeung and David Zhang for their passion, their dedication to the basketball team, and all the advice and help that they offered in preparing for this event. Thank you all! The Chinese Society Football Team has definitely showed their prowess in the Nottingham Games. Entering the tournament as the underdogs, then coming 1st at the group stage, beating IC and the home team Nottingham to get into the final, is, I reckon, sheer brilliance. Despite the defeat by Manchester in the finals, I am sure no one would disagree with me if I said that the team had played with all their hearts and souls, and they had given all their best on the field. They have made us proud. I would like to take this opportunity to say "thank you" to our captain Terence Li, who has been in the team for 3 years, and this being his last Nottingham Games. Thank you for all you have done for the team, it has been a pleasure for all of us to be playing with you all this time. And a big congratulations to our top scorer Adrian Leung, who managed to hit the back of the net on 5 different occasions throughout the day, all being vital goals to our progress in the tournament. Keep up the good work, Adrian! Last but not least, I would like to thank all the supporters again for their cheering. Your support has certainly been a great encouragement to our teams. Without you guys, we would have never been able to achieve these amazing results. Coming top 3 in all the competitions we have entered this year marks a wonderful end to this event. I hope we will continue this legacy in all coming years. Thank you all! A message from Lewina Liu, our Director of Productions. Congratulations to the new LSECS Variety Show Committee 2011/12! For those who are interested in participating in the Variety Show (backstage crew, performers, actors, etc), remember to keep yourself updated at our Facebook Page or contact the corresponding committee member directly for further information. Make this an opportunity for you to participate in our flagship production and an experience to be remembered for life. We need everyone's help and support to uphold the LSE legacy! Lastly, do join me and congratulate all the new committee members again! Keep up with the LSE spirit and continue to make it the best Variety Show throughout UK! A message from Cindy Cheng, our Director of Welfare. I would like to use this opportunity to congratulate those who successfully made it into this year's one. Campaign Subcommittee and also to introduce to you all to the new one. team. For those who did not make it, please do not feel disappointed as there are many chances for you guys to help out at our events. The one. Campaign welcomes all those with passion to contribute to the Society by participating in charitable events. Let's welcome our team of this year and show your utmost support! An invitation form the one. Team. We are the team behind the LSESU Chinese Society one. Campaign. We are delighted to present our first project of the year — 【一品茶棧】! 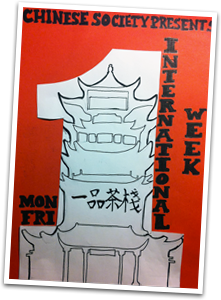 As part of the LSESU International Week 2011, we are opening our first tea and dessert house on Houghton Street this coming Monday and Friday! We couldn't be more excited to showcase some genuine, traditional Hong Kong desserts to the whole of the LSE community. And what better way to keep yourself warm than with some hot Chinese tea?! We welcome all who are interested in discovering our unique culture, and of course all our friends from Hong Kong who wish to give a taste of our hometown classics! This is a two-day only charity sale. All profits will be donated to Project Little Dream. Please come along to support our charity campaign! Candied strawberry coated with sugar icing on bamboo skewers. A traditional Chinese snack originating from Beijing. Maltose syrup sandwiched between saltine crackers. A Hong Kong and Taiwan classic. Tasty creamy pudding with mango bits. Extremely popular within the Hong Kong community. As well as promoting the characteristics of our culture, the Chinese Society is also determined to expand our sphere of influence in making a difference to our respective communities. Each year the one. Team initiates a series of charity events in both London and Hong Kong, where all funds raised are dedicated towards our selected charitable or social organization in the beginning of the campaign. This effort is further reinforced by our cooperation with the relevant societies of other London universities, as demonstrated by the successful “one. Talent Show” organized between the London Universities in March 2011. The one. Campaign does not only represent our contributions towards the community but is furthermore a collective effort to make a difference on behalf of the student body in LSE. We pledge for your support. Time for some winter fun. This winter, we invite you to join us for a joyful ice skating experience on London’s most glamorous ice rink at Somerset House. Whether you’re gliding along to the sounds of Tchaikovsky or top DJs, it’s a festive experience that’s hard to beat. For those of you who wish to reserve a place, please email us your full name, course and contact details at su.soc.chinese@lse.ac.uk with the subject heading "Ice Skating Trip". The deadline is 16 November, 2011 (Wednesday) at 23:59. "We are keen to meet any Mandarin-speaking law or non-law students/graduates with an interest in pursuing a career as a solicitor in an international law firm. For those are interested, please email the LSESU Chinese Society at su.soc.chinese@lse.ac.uk indicating your level of fluency in Mandarin and email address." Clifford Chance LLP is a global law firm headquartered in London, United Kingdomand a member of the 'Magic Circle' of leading UK law firms. It is one of the ten largest law firms in the world measured by both number of lawyers and revenue. 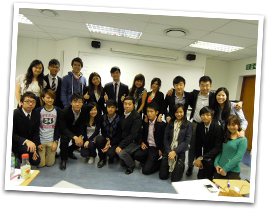 The LSESU Chinese Society aims to integrate and promote the cultural identity of the Chinese community within LSE. Having one of the largest membership bases within the LSE Students' Union, we hope to provide a warm and welcoming environment for all Chinese students entering the School. We continue to expand our influence beyond the academic sphere, by devoting ever greater attention to social, careers and even charitable events. In doing so, we expect to create a diversity of opportunities for our members to reach their aspirations. Copyright © LSESU Chinese Society 2011. All rights reserved.